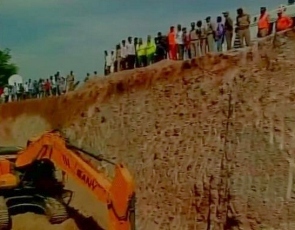 A four-year-old girl, who accidentally fell in an open borewell at an agricultural field in Telangana's Ranga Reddy district on October 12, was found dead on Tuesday afternoon, the police said. The decomposed body of Girija was located at a depth of 45-feet, deep inside the borewell in water, and efforts were on to retrieve it, they said. "The girl's body has been located inside the hole and we are trying to take it out. The body was located through a camera at around 3 PM today," ACP (Ibrahimpatnam division) Ramulu Naik told PTI. "The body is in a decomposed condition. After conducting post-mortem, the body will be handed over to the family members," he said. The mishap occurred on Sunday morning on the outskirts of Manchala village of Ibrahimpatnam in Ranga Reddy when Girija accidentally fell inside the open borewell while playing, when her grandparents were working in the field. Massive rescue operations continued for the third consecutive day on Tuesday to locate the girl. The area around the borewell was dug to reach out to her. Oxygen was also pumped inside the hole. Police and revenue officials, besides teams of National Disaster Response Force, fire, geologists and members of coal mining company Singareni Collieries were involved in the massive rescue operation. The nearly 300-feet deep borewell was dug around six months back. Though it did not yield water, it was left abandoned and uncovered. Due to a cover of bushes on the ground, it was difficult to make out if there was a borewell there, the police said. Manchala police station inspector P Jagadeeshwar said they have already registered a case of negligence under relevant sections of the Indian Penal Code against the owner of the land.